Another hot, Hot, HOT Iron Pour in the Valley! 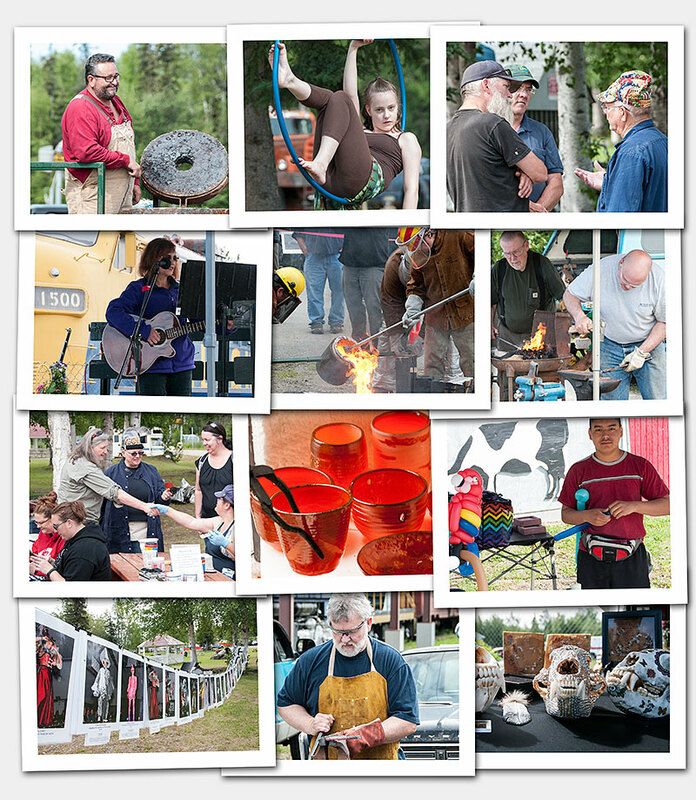 On June 25, for the 9th consecutive year, the Valley Arts Alliance Art on Fire Iron Pour Art Fest was held at the Museum of Alaska Transportation and Industry in Wasilla. The Valley was buzzing with artists from across the country, as they gathered to cast unique iron sculptures, create Raku pottery, and engage in other similar “fiery” events. A team of skilled foundry men and women, consisting of Pat Garley, who owns Arctic Fires Bronze in Palmer, D’jean Jawrunner, a college professor from New Mexico who teaches metal casting, Donnie Keen a commercial foundry owner from Houston, Texas, and other local sculptors and skilled metal workers demonstrated the fascinating 5000 year old iron casting process using a custom designed furnace known as a cupola. In the weeks preceding this event, Pat Garley offered workshops in metal casting and mold making at his studio in Palmer. These workshops continued at the VAA Art on Fire Iron Pour Art Fest, where these molds were poured with liquid iron. See examples of completed iron sculptures from previous years that were displayed at the International Gallery of Contemport Art in Anchorage on our 2012 Art on Fire Sculpture archive page. In addition to the iron casting, artist Sandra Cook, who owns SL Cook Pottery and Fiber Werks in Palmer, conducted her Raku pottery workshop. Sandra provided each participant with a vessel or pot of unglazed ceramic ware, known as bisque, which the participants decorated with a variety of glazes and then fired in one of Sandra’s special Raku kilns. After a short firing, the “red hot” vessels was placed inside a metal can full of combustible materials, a process that draws the oxygen out of the glaze and is responsible for the unique and completely unpredictable Raku look. Other artists demonstrated and displayed their fiery art throughout the day including Judy Vars, who demonstrated Encaustic wax painting, and the Association of Alaskan Blacksmiths, who demonstrated blacksmithing techniques. The amazing Sahara Storm Tribal Dance Troupe performed their fire dances, and outstanding music was provided by the group The Feral Cats, consisting of Greg Gusse, Julie Hopkins, Heather Resz, and Hillary Saffran; Devynn MacLure; the group No Wake, consisting of Patrick Wake, Sean Renard-Wake, and Michelle LaRose; Hillary Saffran; John and Joe Stroup; and the Jerry Wessling Band, consisting of Jerry Wessling and Michael Consalo. This day was an extraordinary Iron Pour Art Fest in the Valley!